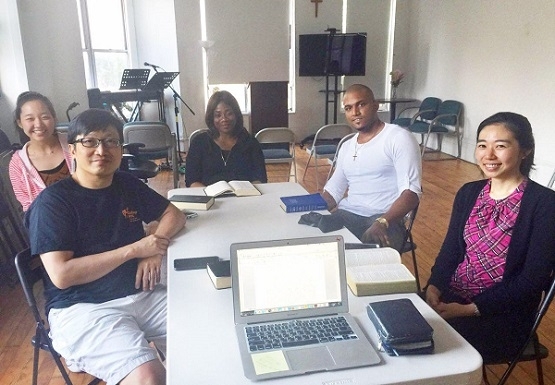 NY Immanuel Community Church Thursday 5 pm Bible Study continues to grow with new comers. People long to know deeper the word of God gather this day and share the work of God in their individual life. In a recent Bible study, the message in John Chapter 4 of the Samaritan woman who met Jesus was delivered and everyone who attended receiving abundance grace. After the message, they all shared their reflection about how they all used to pursue worldly things, like the Samaritan woman, looking for the water that can truly quench her thirst but failedEach shared their sincere testimony how God changed their life. Sister Dorothy shared how she used to seach for movies that can touch her heart, after knowing the wonderful love of God revealed through Jesus, who even though being a Creator above all things is willing to stay and form a relationship with her. Her heart was moved and drawn to find the true satisfaction in the Lord. May God keep adding new comers to thw Thursday Bible Study and fellowship that more can listen to the word of God and find true satisfaction in Christ Jesus.